Five-time world champion Ronnie O'Sullivan says he is "still fighting and punching" after reaching the final of the Tour Championship in Llandudno. The 43-year-old beat Judd Trump 10-9 in the semi-final and will become the oldest world number one since Ray Reardon in 1983 if he takes the title. Trump, who defeated O'Sullivan in the Masters, said he was "gutted" after missing a match ball yellow. O'Sullivan last led the world rankings nine years ago - in May 2010. 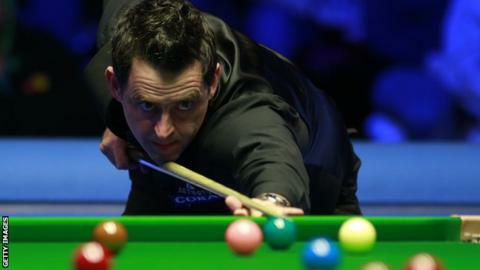 "You've got to enjoy the moment sometimes," O'Sullivan told BBC Sport. The current world number two - who will meet Neil Robertson or Mark Allen in the final which starts on Saturday - would replace Mark Selby as number one if he wins. "I'm 43, 44, knocking on and I'm not sure there's going to be too many of them. There's very few people that have been the best in the world and the greatest at what they've done, so I feel like I'm in that bracket," he said. "Maybe there's eight billion people on this planet. How many can say they are the greatest at what they've done? "For me, I've had the ultimate experience of being the king of my sport and I'm still fighting and still punching and I'm proud of that in many ways." Trump, 29, had led 6-2 at the mid-session interval and was also 8-5 up until 'The Rocket' won five of the last six frames. "I'm gutted really and annoyed because I had my chances in the last frame," Trump said. "That yellow, I think I completely took my eye off it, I was just trying to play for the green. I'm just devastated." Earlier in March, O'Sullivan became the first man to reach 1,000 career centuries when he sealed a 10-4 win over Neil Robertson in the Players Championship final. He also holds the record for the most victories (19) in the Triple Crown tournaments - the Masters, UK Championship and World Championship. And while he is now just one victory away from equalling Stephen Hendry's record of 36 ranking titles, O'Sullivan says his love of the game is driving him on. "I'm just not driven by records," O'Sullivan added. "I don't buy into that sort of stuff and I'm glad that I don't as you take the beauty out of the game and it all becomes about statistics. "For me, I'd trade every ranking point I've made and every bit of prize money just for the experiences, the love and the highs that I've had from playing this game since I was a kid. You can't buy that."